Martin Armstrong was born in New Jersey the son of a lawyer and Lt. Col under General Patton in World War II. Martin was encouraged by his father to get involved in computers during the mid-1960s. He completed engineering both in hardware and software but after being offered positions by a government contractor RCA in Thule Greenland, Guam, or Vietnam, he decided to go back to gold business that he had first began working while in High School to earn money for a family trip to Europe in 1964 for the summer. He continued to work on weekends through high school finding the real world exciting for this was the beginning of the collapse of the gold standard. Silver was removed from the coinage in 1965 and by 1968 gold began trading in bullion form in London. 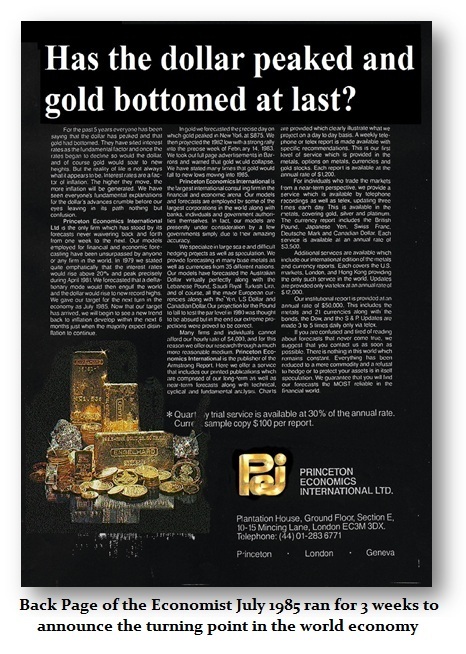 The gold standard collapse entirely in the summer of 1971 and gold became legal to trade in America during 1975 in bullion form. Previously, the market for gold had always been in coin form as long as they were dated prior to 1948. Armstrong began his studies into market behavior when first becoming fascinated by the events during the Crash of 1966. Working through this period exposed him to the real world compared to the theories offered in school. When his history teacher showed an old black & white film, The Toast of New York, starting Edward Arnold and Cary Grant, which portrayed the gold manipulation of Jim Fisk that resulted in the Panic of 1869, his perception of the world was changed forever. This was the Panic when the term “Black Friday” was coined because the mob stormed Wall Street and was dragging the bankers from their offices and hanging them. The riot prompted troops to be sent in to restore peace. A scene in this movie showed Cary Grant reading the prices of gold from the tickertape as it hit $162 in 1869. Since gold was $35 in the 1960s, there was clearly something wrong with the whole linear thought process of economic history. Armstrong became captivated by this shocking revelation that there were not just booms and busts, but also peaks and valleys that would last centuries. Armstrong pursued his studies of economics searching for answers behind the cycle of boom and busts that plagued society both in Princeton and in London. He began to do forecasting as a service to institutional cash market players in gold that included Swiss banks. As currency also began to float in 1971, Armstrong found the gyrations thought-provoking and began to notice the same oscillations that appeared in stocks in 1966, real estate into 1970, and gold as it rose to $42 in 1968 and fell below the official price of $35 in 1970, were manifesting in the rise and fall of currency prices. Armstrong became one of the very first to being forecasting currencies. Because gold was making a high in 1980 that Armstrong believed would last for the typical 26 year period, he decided to retire from making markets. He had been one of the first to establish over-night markets before there were such trading desks. Relying on friends in Hong Kong and London, Armstrong had made markets after New York closing when no one else would. With people lining up at all sorts of stores to sell gold for cash, those dealers needed someone to buy the scrap gold. Armstrong was one of the top three buyers in the country as small dealers sent their purchases to Armstrong who then contracted with Englehard in New Jersey to refine the gold pouring it into acceptable exchange traded bars. Most assumed he was speculating, but in fact, with Francis Lee, he would sell in Hong Kong, but in the cash markets, delivery was then required in London the next day. Friends would make the delivery in London in the morning and by New York opening, Armstrong would exchange that position with a New York contract. Getting by on at best 4 hours sleep, when his model proved to be correct on gold project both the price and time to the precise day of January 21, 1980, he announced his retirement. It was at this time that his many clients around the world requested that he still publish his analysis. He was not interested in this idea, but client eventually convinced him they would pay $2,000 and hour for his work. Princeton Economics was thus born as the research was spun off as a separate company. 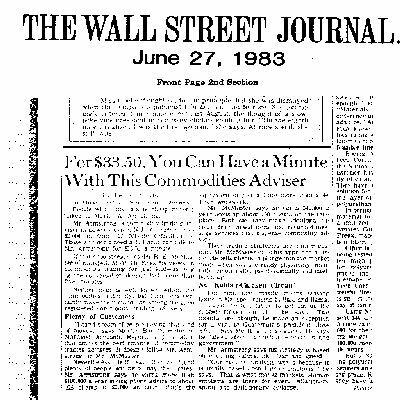 On June 27, 1983, Joseph Perkins Staff Reporter of Wall Street Journal had heard about Armstrong and the rate people were paying to obtain his analysis and wrote a story entitled ”For $33.50 You Can Have a Minute with This Commodity Adviser.” Armstrong eventually raised his rate to $10,000 an hour trying more to restrict business, than attract it. Since Armstrong was providing forecasting for clients generally three times during the course of each trading day, it began on a closed-circuit telex system – a forerunner to the internet among professional dealers. Eventually, the reports were transmitted by Western Union, and the cost to deliver such reports could be as high as $75 each. A client taking all the all markets would have to pay up to $250,000 annually just in communication costs. For this reason, the analysis tended to be institutional due to the high cost. This prompted the opening of offices overseas to reduce the costs of delivery. Trying to manage overseas offices from the United States was impossible, and Armstrong began to take in partners in each country. As a consequence Princeton Economics International, Ltd was born. Armstrong became the chairman focusing on the research while the partners became the managing directors around the globe. By 1985, Armstrong was certainly one of the top premier Foreign Exchange analysts in the world. 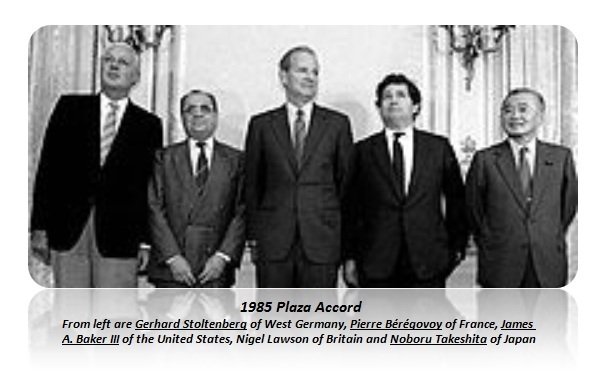 He stepped up in 1985 when James Baker was convincing President Ronald Reagan to create the G5 (Group of 5 now G20) nations to manipulate the currency values to affect the trade deficit, which became known as the Plaza Accord. In Britain, this meant the abandoning of monetarism and the adoption of a de facto exchange-rate target of 3 deutsche marks to the pound (ruling out interest-rate rises), and excessive fiscal laxity (in particular the 1988 budget) unleashed an inflationary spiral. This also set the stage for the eventual attack on the pound in 1992 to break that peg to the Deutsche mark. Armstrong’s work into previous floating exchange rate systems (including the American Civil War and the Panic of 1869 when gold traded on the NYSE), led him to then warn the President that artificial manipulation of currency values would lead to greater instability and give birth to rising volatility. 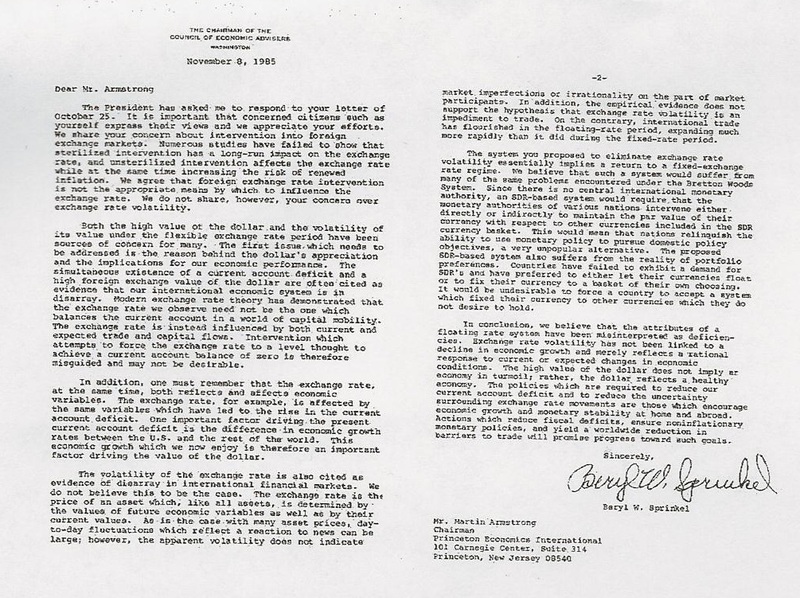 In a response from the White House on November 8, 1985, on the one hand agreed currency manipulation was not the way to go, but on the other hand, they failed to agree with the concern about increasing volatility: “We do not share, however, your concern over exchange rate volatility,” wrote Economic Advisor Beryl Sprinkel. In 1986, Armstrong published The Greatest Bull Market In History. 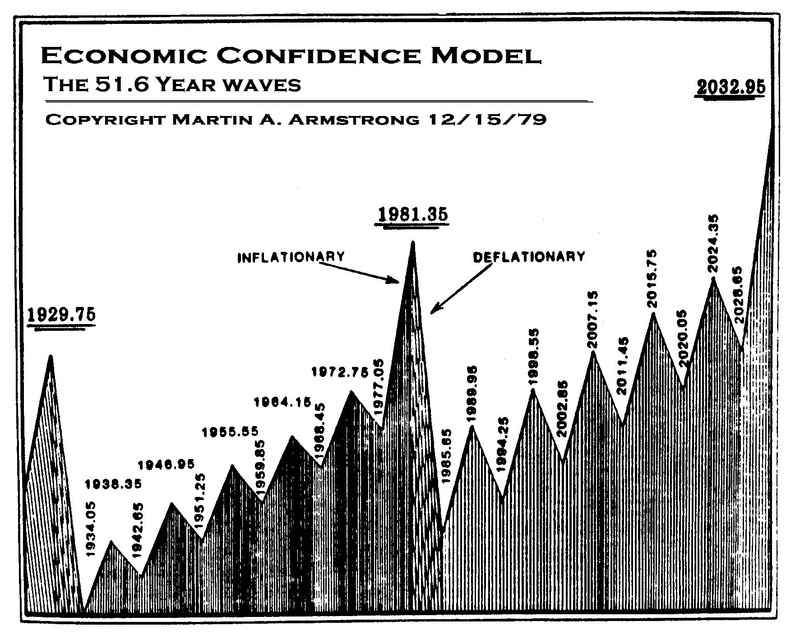 This was the first study ever written that put the entire world events together demonstrating that the Great Depression of the 1930s was a Global Capital Flow problem set in motion largely by sovereign debt issues that led to a massive capital flight into the dollar the created a tidal wave of deflation. By the 1987 Crash, the Presidential Task Force (Brady Commission) was then calling upon Armstrong for help recognizing that volatility had become the number one problem. Because Armstrong had then forecast that the low was in place and that new highs would be seen in the stock markets before new lows, institutional brokerage houses were begging Armstrong to address their retail audiences. He agreed given the fact that most analysts were calling for a Great Depression. Armstrong then appeared before audiences exceeding 25,000 around the world from Europe, Canada, Australia, New Zealand to Hong Kong, Singapore and Japan. Armstrong warned that the capital flows had been shifted with the 1987 Crash much like there were after-shocks following an earthquake. He warned that the G5 had made an egregious error trying to manipulate currency values to reduce the trade deficit. He warned that by lowering the dollar value by 40% from the 1985 high, not merely made American goods cheaper overseas, it also devalued American assets held by foreign investors and that was what caused the 1987 Crash as they panicked and sold. Now money was being repatriated and the new capital concentration was taking place in Japan. Armstrong then warned would peak in December 1989. When that took place with the Nikkei reaching its high on the last day of 1989, the bubble burst and Japan would begin its Great Depression that would again last for about 26 years, the same time duration that took place in the United States after 1929. The American boom postwar began 1955. Now central bankers were calling Armstrong personally wanting to know if this would be a depression outside of Japan or would be another short-lived even like that of 1987? Capital flows again shifted and now turned toward Southeast Asia. By 1994.25, that trend peaked and capital began to shift once more back to America and Europe with the approach of creating the Euro and the handing back of Hong Kong to China. Indeed, the S&P 500 bottomed precise again to the day on 1994.25 as it did in 1987. About 3.14 years from the 1994.25 shift in capital flows, the Asian Currency Crisis appeared on target. Armstrong was being called upon by many governments in the West. Committees working out the plans for the Euro sought the results of this global model. But in 1997, Armstrong was requested by the Central Bank of China to fly to Beijing for a meeting. Armstrong was perhaps the first independent Western analyst ever to be invited to China. 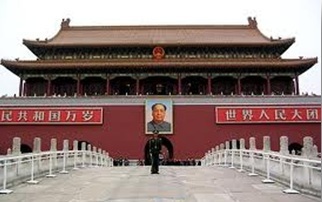 Princeton Economics had entered an agreement with China to do all the forecasting within its economy. China was keeping track of 249 varieties of tea alone and the diversity of prices around the nation for the same tea. On July 18th, 1996, Martin Armstrong was invited by the US Congress to brief it on the world economy. He testified before the full House Ways & Means Committee on this complex subject or the interworkings of the Global Economy. 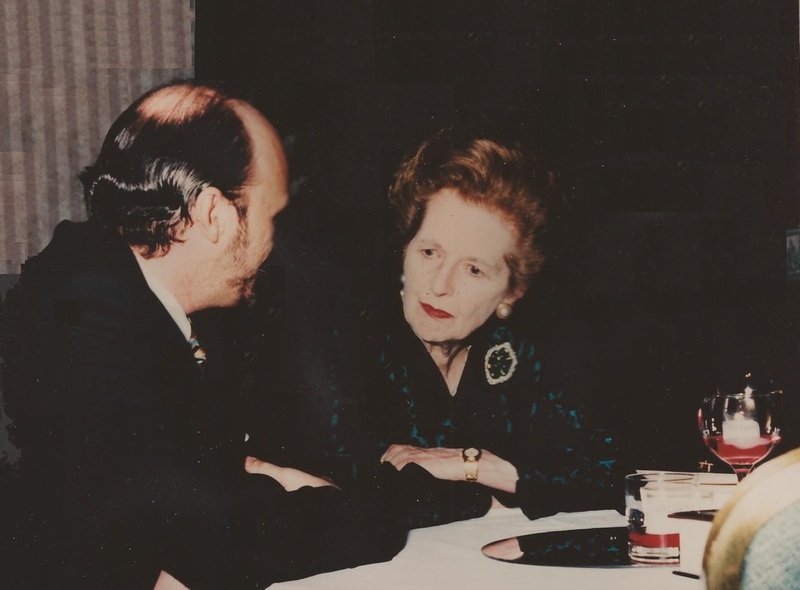 report “It’s Just Time” based upon his political discussions with the Prime Minister who made that remark regarding the upcoming elections in which she believed John Major would lose because the conservatives held power long enough and respected that there was a cyclical rhythm to politics. Armstrong’s work has become world renown. This model has successfully pinpointed not merely major specific days who events well in advance, but it has provided one of the most consistent guides for understanding the turning points in the global economy and thus the business cycle not merely within a domestic economy, but within the global economy on a collective basis. This has been demonstrated by numerous articles. Not merely did we use the back cover of the Economist Magazine in July 1985 to announce a break new change in trend and the end of deflation, but again Barrons just reported in June 2011 that the model was once again called for a change in trend that would manifest itself in stocks and they approach new highs once again. Armstrong’s model “made several eerily on-the-mark calls using a formula based on the mathematical constant pi.” (Pg 30; Nov. 30, 2009). “His model singled out, in advance, the day of the October, 1987, crash. 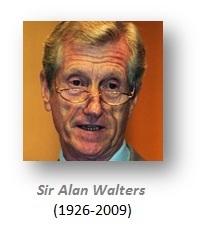 … Pi suggested some future turning points which Armstrong watched carefully as they approached. Among them was December, 1989, which marked the Nikkei’s peak before it crashed. 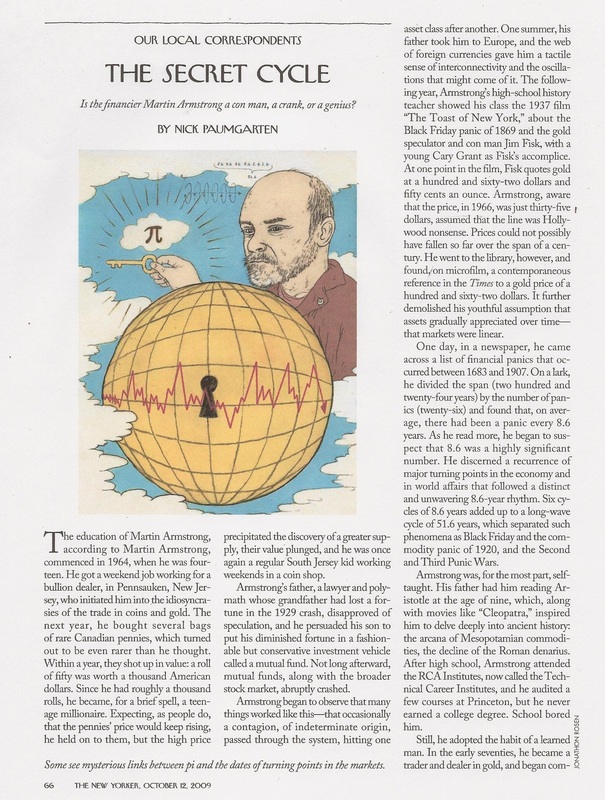 This call earned him the magazine Equity’s award as the top North American economist, and a big following in Japan, where the idea of cycles, a tenet of Eastern belief, did not seem so far-fetched. He presided over conferences in the ballroom of the Imperial Hotel in Tokyo and began investing billions of dollars on behalf of Japanese clients. He boasted that the Japanese called him Mr. Yen. Another big pi date was July 20, 1998, which turned out to mark the high point in the S. & P. just before a Russian default broke the giant hedge fund Long Term Capital Management and nearly wrecked the ﬁnancial system. Armstrong by now was running a couple of hedge funds, and the Magnum Hedge Fund Reporter named him Fund Manager of the Year.